What an adventure! 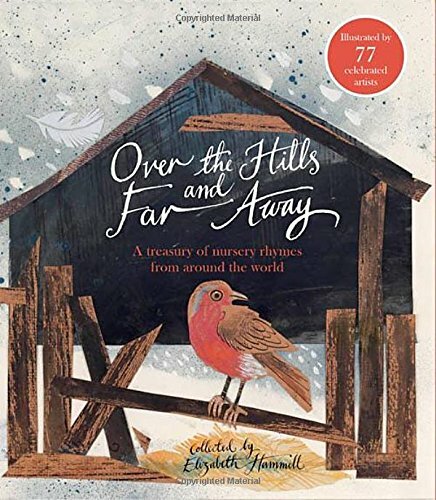 Although I had heard from afar of the preparatory work going on over the hills and far away, I never discovered if Elizabeth had actually travelled the roads among the Inuit and the Jamaicans and the Chippewa and the Ghanaians, all the way to Australia. But whether she did or not, her journeyings among their songs and their diverse ways of illustrating their songs was surely adventure enough. Similarly, you can have designs ranging from (my favourites) the straightforward linear narratives that move with the progress of the rhyme (Marcia Williams on “Old Mother Hubbard” with interjections from the lady herself; John Lawrence and a winding procession of persons summoned by London's bells) to slabs of colour that overwhelm their simple texts (Hannah Bantry and Jack Sprat by Nick Sharratt), or even incomprehensible jumbles (drawings for two rhymes by Olivia Lomenech Gill). Also, while in critical mode, one could wish that authors whose work has been drawn upon (Sara Coleridge, Jane Taylor, etc.) had been duly acknowledged, which would have led to Higglety Pigglety Pop being revealed as by Samuel Griswold Goodrich who was American, rather than English. This is not the first time that such an ambitious nursery rhyme compendium has been projected in this style. In 1988, for a very similar reason, Iona Opie went gathering some Tail Feathers from Mother Goose when the late Sebastian Walker brought his skills to bear on raising money for the Opie Collection to go to the Bodleian Library. Sixty illustrators were dragooned into making pages for that book (nine of them are also to be found here) and it is fascinating to add further comparisons to treatments of similar subjects. Iona though was refining variants and new discoveries of rhymes in the British Isles and America; Elizabeth has made the world her subject and a happy razzmatazz she has made of it. May it enjoy a long, long life, generating fun for rhyme-lovers across that world and spreading the news of the growing fame of Seven Stories.